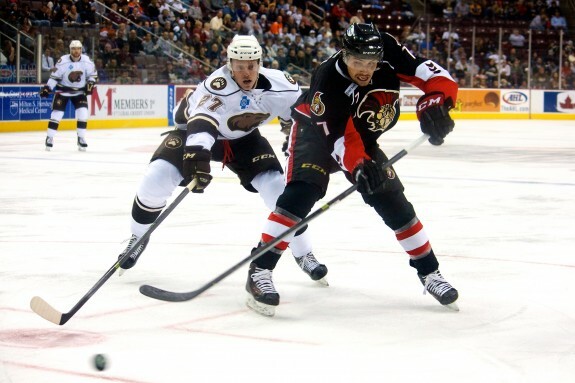 With the Hershey Bears season over, the team looks to make some changes to get back to the AHL postseason in the 2014-15 campaign. The team only has a few players under contract for next year, with a lot of their roster to be determined by Washington along with AHL signees by Hershey GM Doug Yingst. One decision the Capitals will have to make is whether to bring back improving forward Ryan Stoa. Stoa, 27, recently completed his second season with the Chocolate and White and tied his career high in points for a season at the AHL level (40). Stoa played center for a good part of the year with then line mates Brandon Segal and Nicolas Deschamps on Hershey’s top forward unit. He set a career high in assists (24) in the American League in 67 games played, his second most in any hockey season. The former second round selection by the Colorado Avalanche in 2005 played three games in the NHL for Washington this season, but didn’t record any points. He has seven points in 40 career NHL contests. Stoa impressed enormously at the AHL level this season and his 6’3”, 212 pound frame provides good use for any team. He also was Hershey’s best weapon in the shootout, scoring in nine of his 11 attempts following the five minute overtime period. The Capitals and Stoa have not discussed a new contract, Stoa’s agent told The Hockey Writers this weekend: “We have not discussed a new contract yet”. The lanky forward earned $115,000 at the AHL level this season and held a $550,000 cap hit as he becomes an unrestricted free agent likely looking for a two-way contract. Stoa did cool off at the end of the season, recording just three points (two goals, one assist) in his final 11 games played. He registered 14 shots on goal in eight April contests, lower than his season average of over two shots per matchup. Stoa played for the Gophers at the University of Minnesota prior to turning pro, accumulating 97 points in 120 games, an average of .81 points per game. He was the Gophers’ Captain his senior season. Washington’s unrestricted free agents that played the majority of the season in Hershey include goaltender David Leggio, defensemen Tyson Strachan, David Kolomatis, Chay Genoway, Julien Brouillette and forwards Brandon Segal, Matt Watkins and enforcer Joel Rechlicz. Hershey Bears awards: Dan Sernoffsky Award (Most Improved): Ryan Stoa. Washington should make a push to retain Stoa, due to his upside. The former Lake Erie Monsters forward will likely wait and see to July 1st to test the market before considering a return to Hershey for a third straight season. Any NHL opportunity would appeal to the 27 year old. You can view all of the Bears and Capitals free agents who played in Hershey, here, via the Patriot News.